The first question that many people consider when they are thinking of renovating their kitchen is the cost. Renovating your kitchen can completely transform the look and feel of your home. The kitchen is the central hub of any home, and it makes sense that having an out of date or drab kitchen can bring the feel of the house down. Additionally, a remodeled kitchen can be a genuine asset to your home if you are looking to sell it. Sometimes, home-buyers will judge the kitchen harshly. Having the right kitchen can definitely make your home more appealing to buyers and often the costs of remodelling your kitchen are outweighed by the increase in value. Kitchen renovations come in different options that can affect the cost. Depending on the state of your current kitchen, your personal preferences and the size of your home, the costs can vary. On the cheaper end of the scale is a basic kitchen face-lift. A kitchen face-lift involves keeping the main body of the cabinetry while replacing doors and bench tops. This can be an excellent option if you’re on a budget and your kitchen is out of date but is in a generally good condition. On the other end of the scale a full remodel involves removing all the infrastructure of the kitchen and replacing with a new custom design. The design, manufacture and installation of the new infrastructure is a significant contributing factor to this cost. Yet there are other significant costs. A full remodel may require installation or movement of existing plumbing and electrical infrastructure. This will require licensed trades people to undertake this work. Furthermore, a new design will result in the replacement of all fixtures and appliances. A Kitchen Builder to manage all the project. A Kitchen designer to create a design that suits your space. A Plumber to install taps, sink and other plumbing infrastructure. Tiler for your splash back. Electrician to install any new power points and wire up appliances. Of course what fixtures you chose impacts the cost as well. 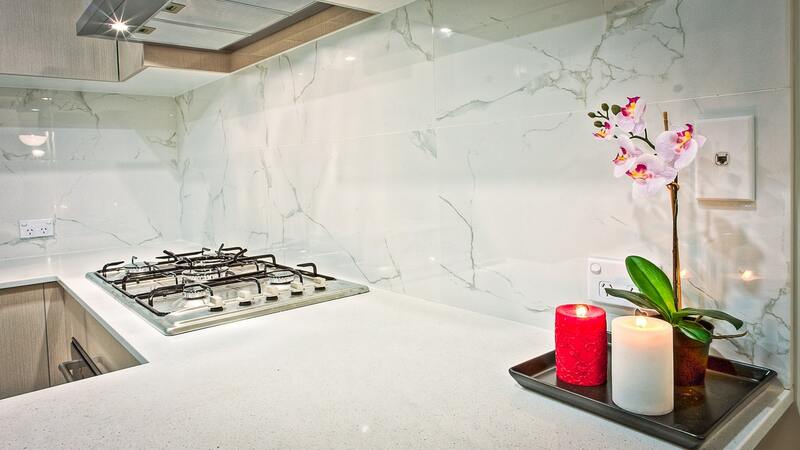 For example, granite benchtops are significantly more expensive than laminate. Similarly, what cupboard materials you choose can significantly range in cost. To help understand all the costs of renovating a midsize kitchen we’ve outlined many of the materials & tradesmen required below. There isn’t really a “Standard” or “Average” kitchen any more, we need to understand what is average to one person is vastly different to another. Plus when we talk about costs associated with tradesmen such as plumbers and electrician, this is again another area where nothing is really standard. The prices can fluctuate with changes in the position and layout of the kitchen or adding in many extras, such as USB dual power points. At Hollywood Kitchens we like to have potential clients come visit us here in our showroom. It is here where we find out from them what they are looking to do and products they like. Doing this allows the creation of a custom quote which will achieve the kitchen of their dreams. Feel free to contact the helpful staff at Hollywood Kitchens about organizing your obligation free quote on your new kitchen.